My Life! Teaching in a Korean University, take 2. Over and out for the next few months! Live in South Korea? Like to save money? Check out this post! Enter for your chance to win some awesome. The contest ends in 5 days, so bali-bali! Speaking of even more awesome, did you know that this blog has moved? Go to the new and improved My Life! Teaching in a Korean University. This is the book that every elementary school ESL teacher needs to have in their libraries. There are 39 no-prep or low-prep, interesting, engaging and fun activities. I give you my personal guarantee that they'll make your classes awesome and lesson planning easy. Only electronic version for now, but the print version will be available shortly. Stop answering all those newbie questions! Just send 'em to this book. This site will no longer be updated (although the content will remain). I've started the very (slow!) process of moving the best posts from this site over to a new one. Put it into your feed to stay updated. Working in Korean Universities- Good for the Long-Term? 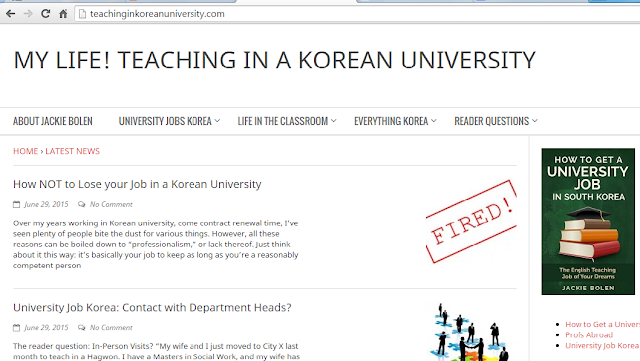 An interesting topic came up during my recent Kotesol presentation on How to Get a University Job in South Korea . Someone asked whether they should get a PhD or teacher's certificate in order to improve their employment prospects at Korean universities. My answer was that they should get a teacher's certificate which opens up the possibility of international schools, which are actually better jobs than Korean unis for a host of reasons but the way the conversation turned was whether or not Korean unis are good jobs for the long-term. Once you have a job like I do (full vacation, 3 days/week, high pay, teaching only English majors), there is quite literally nowhere to go but sideways or down. I could be promoted to the "head teacher" but this almost always involves way more work for no extra money--it's usually a total headache and I wouldn't really wish this position on my worst enemy. Korean universities generally pay all teachers equally--like someone can have 10 years experience, a CELTA/DELTA, do presentations at professional conference (me!) and get the same pay as someone who gets the job with one year of experience at a hagwon. Great teachers often get more work heaped on them such as proof-reading, organizing camps, or recruiting new teachers but often don't get any extra pay for this. I would love to work at a place that was serious about helping teachers improve their skills. Like in almost 10 years, I haven't been observed in a class, ever. It's my guess that 99% of the universities in Korea don't care about this and it's up to the individual teacher to put the work in, if they care about it. Many don't. It's basically an employer's market right now because of the large numbers of very qualified teachers floating around Korea. It's only going to get worse due to demographics because there will be fewer and fewer college age students in Korea. Job conditions will not be going up in the next 5-10 and I personally find it quite demoralizing to work at a job year after year and not see an increase in my salary. Working at a Korean university is a sweet job--for a few years. You can start a side business, travel the world, write a book, etc. But, unless you're married to Korean, I don't recommend making this your long-term plan. It's a big world and there are certainly better jobs out there, especially if you're a "real" teacher.